My theory is that the art and the music all come from the same place in my brain. This may or may not be true, but I have convinced myself. And it all flows back and forth quite nicely…. killer bees pollinating Venus fly-traps for ever and a day! 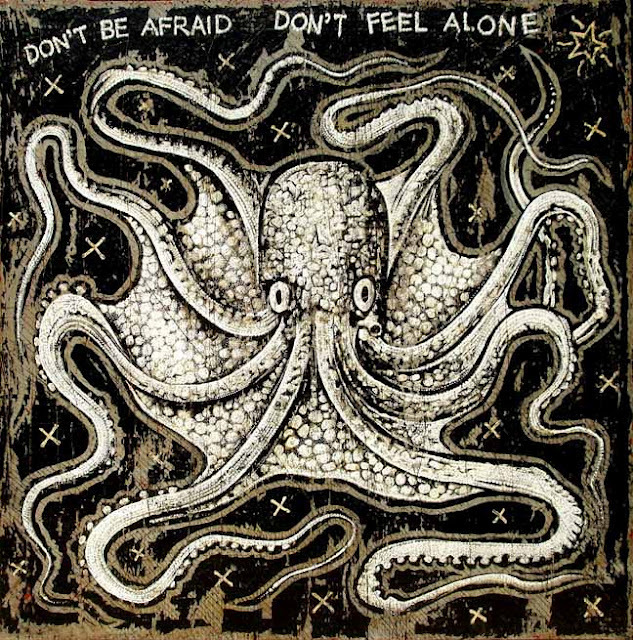 This image (“Don’t Be Afraid”) has been haunting me since seeing his work up close at the Clay Street Press in Cincinnati. It’s hard to convey his jolts and textures on a computer screen. They’re iconic and distressed and distressing and and there are also these gorgeous hopeful bits of aquablue everywhere. I guess it’s just more of that life stuff seeping through, the stuff that is usually the reason an artist keeps at it regardless of the tendency to have to climb up steep hills to do anything aside from the default. 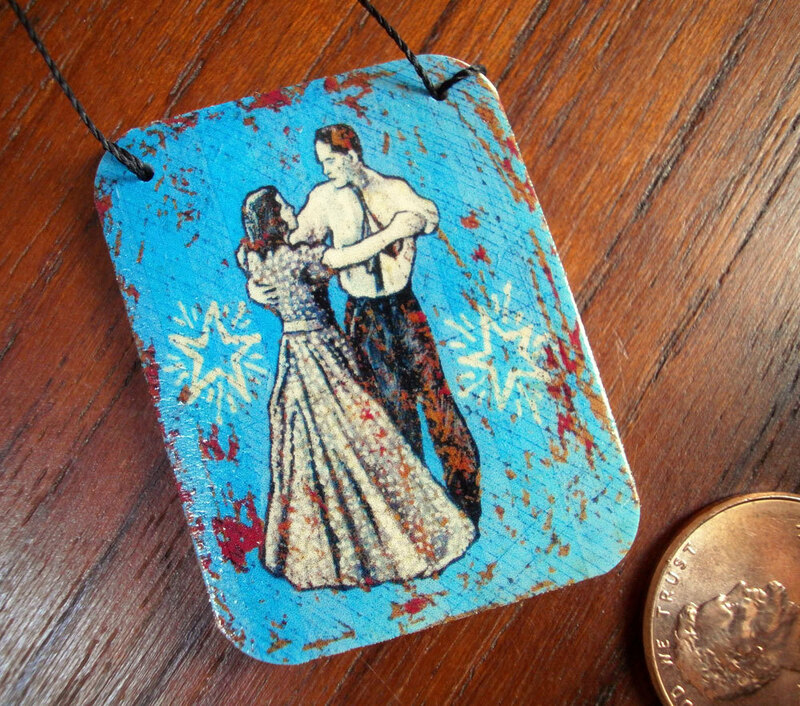 A wee wearable print of Langford’s, a gift from my husband, from RockCandybyHelen on Etsy. Maybe my vision of interdisciplinary aesthetics really comes down to not accepting defaults. Put another way, if we stop thinking, what is the point? Seems to me the point is to make things that weren’t there in the first place. To make things from nothing. Is that what making art is? Music? Writing? There’s stuff (somewhere, in a tube, in the brain, somewhere we find it) and we make new somethings. The stuff and the brain or soul or gut collide and make new somethings. This entry was posted in Uncategorized and tagged art, Etsy, Interdisciplinary Aesthetics, Jon Langford, painting, RockCandyByHelen, words, writing. Bookmark the permalink. Rebecca, You talk here about one of the things that Jerry Dennis said that has been haunting me. When he was talking about his son doing a video trailer for his book “The Windward Shore”, he stated that he thought the world of the writer was vastly different from the world of the visual artist. I see them as the same, just different tools. Maybe I am naive about this. After watching the video, I could see how the father was so amazed that his son had this talent of visual that he did not think he had, but I can not help but think that it is the visual that drives Jerry Dennis to write. I love to make videos and I love to experiment with digital effect, so I was caught up in the too many graphic techniques instead of the natural beauty of the world. I found myself not hearing the words. I saw a divide between the written and the visual that I did not think should be there. I wanted to just melt into it all like I did when he was doing his readings. Is it because they think that writing and visual arts are separate that it did not become an interdisciplinary masterpiece for me? I plan on blogging my experiences of each of the instructors so perhaps when I flush this all out, I will reach some sort of understanding. Right now, separation has value of its own but a work flies when the artist is able to use multiple mediums to expand the vision they want to effective communicate.